Do you find that you're struggling to Handel your love for Baroque music? Perhaps you find yourself irked Vivaldi attention given to the Classical period and not the Renaissance? Well, have no fear, here to Tallis all about it is event organiser Beth Potter. Ned: What is early music, what do you mean when you say early music? Beth: Ah so this is an interesting one. I had someone mistake one of my flyers from last year for a kids’ music concert – sadly it’s not that. Early music is basically renaissance and baroque music up to 1750. It’s stuff that most people think is quite out of reach; it’s quite academic, the way that people approach it, normally. They use different instruments, weird violins. There’s a burgeoning interest at the moment in historically informed performance; playing on the original instruments or reconstructions of them. The aim of the festival is not to move it away from the academic stuff – we have a lecture in there – but to bring early music to a bigger audience than would otherwise hear it, and bring it to students in that way. It uses similar chord sequences to those used today, it has that beauty of music we listen to today, but people usually see as unreachable. Ned: So you’re organising it? Beth: It’s kind of a team of people. The director of music at Keble is Matthew Martin, and he’s heading it up, we have a patron called Mahan Esfahani, who’s a great harpsichordist, he’s giving a concert on the Wednesday. And then we’ve also got a team of students, and I’m in that team. I don’t want to say committee, it sounds a bit too organised for us. Ned: So are you a recent convert to the early music cause? Beth: So I got onboard with the early music festival last year, and I didn’t know much about it before then. I wasn’t that interested in historical performance, but I play viola, and I picked up a baroque viola through my friend James, and it’s just really beautiful music. You have to have an open mind, I think – a lot more people will enjoy it than they think they will. The instruments have a really interesting quality of sound, sounds more mellow because of the material they use, I think it adds this otherworldly quality to the music. Ned: Do you think modern music has anything to learn from early music? Beth: Often the periods of music are similar than we think they are. Our patron, Mahan Esfahani, is a great advocate of combining early and modern music; people are getting more interested in programming different these different kinds of music together. For example, Saariaho’s ‘Jardin Secret II’ is scored for harpsichord and quadraphonic tape. We might be able to persuade Mahan to do an encore on his concert of a modern piece. Ned: So, why a festival in particular? Beth: Well the festival itself was founded in 2014 by a student called James Hardie, and the idea of the festival originally was to have headline performances alongside student masterclasses and that kind of thing. So, a festival, I guess, encompasses more than just the concerts; on the Wednesday we have the Bate Players doing a lunchtime concert for students. We have a great collection in the Oxford music department – the Bate Collection – which people can go and see for free; it’s a really amazing resource for us. Mahan is doing a masterclass on Thursday at 11am; the concerts are about listening and learning. We have a lecture on the Friday night about the concert that Matthew Martin will give in the evening of Bach’s ‘The Art of Fugue’, which is a really weird piece; it didn’t say what instrument it was for, and it just kind of ends. Some people think Bach died in the middle of writing it, but we don’t really know. Ned: So when is the festival, and where? 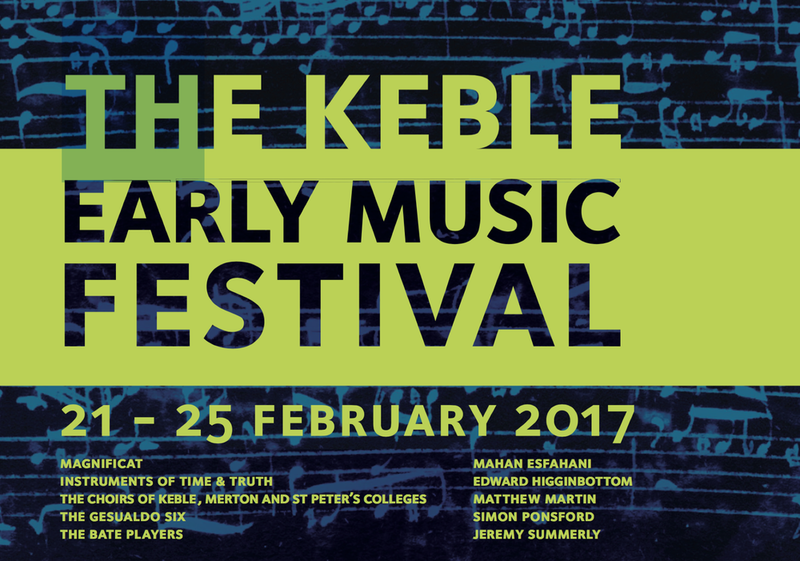 Beth: It’s in sixth week, which for non-Oxford people is Tuesday 21st until Saturday 25th of February, pretty much all in Keble Chapel. There’s also the launch event on the Tuesday at 6:30pm in Keble Café; there’s free wine and sample performances, so come along and see what it’s all about, really.